Designed for children, its soothing interior shelters and isolates both your head and hands making it perfect for a power nap. Dimensions: 14.2" x 10.2" x 4.7"
Circumference opening for the head: 24"
A fabulous idea, but not being able to machine wash the drool out of this is a fail. Spot washing will only go so far after awhile. Sometimes all you need is a power nap—after a stressful day; to counter jet lag; or for a chance to relax. The Ostrich Pillow is a dream come true. Burrow your head and arms into its cozy “cocoon” and you’ll be in dreamland before you know it. Created by Studio Banana Things, a brand that puts the fun in functional, the Ostrich Pillow puts a new spin on relaxation. Recognizing that we spend so much time at work, in front of the screen or in transit, they created this new pillow to help us disconnect and dream. Power napping increases productivity by 34%. 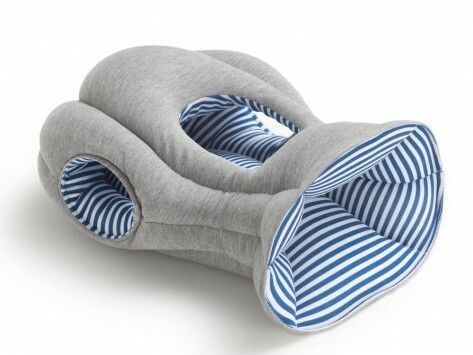 This pillow isolates the head and the hands comfortably so you can relax and replenish. Great for frequent travel, the dorm, the desk, or home, the Ostrich Pillow is like that comfy old sweatshirt you just can’t part with. Block out the noise, the light, and the world for a little catnap. Snooze and awake refreshed.